Please take a look at this inspiring video featuring Lance Armstrong. Consider joining the “army” that will make cancer a national priority. Send an eCard to a friends and family with a link to the Lance’s video. LIVESTRONG Day is our annual grassroots advocacy effort to unify people affected by cancer. In its fourth year, the goal of LIVESTRONG Day is to raise awareness about cancer survivorship issues on a national level and in local communities across the country. LIVESTRONG Day is about doing something to make a difference in the fight against cancer. You can apply to represent your state on Capitol Hill on LIVESTRONG® Day, apply to organize a LIVESTRONG® event in your own community, or just get additional information about LIVESTRONG® Day 2007. Earlier this month, Lance Armstrong was featured in a one-hour special presentation, Saving Your Life. If you missed the broadcast (as did I), you can listen to an audio podcast on the Saving Your Life website. You can also watch survivor videos, locate a cancer screening center near you, share your story of survivorship and more. 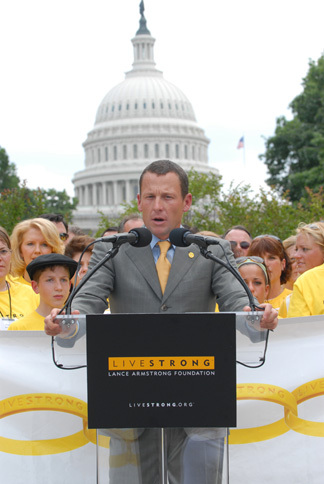 Read Lance’s CNN op-ed piece, Lance Armstrong: Patience running thin with D.C..
Support the Lance Armstrong Foundation by wearing and buying yellow. Even your DOG can wear yellow now! Take a look at this heartbreakingly beautiful photo essay, The Bride Was Beautiful, that captures a bittersweet moment in the fight against cancer in series of striking images by 2006 NPPA award-winner, Romain Blanquart (thanks for posting the link, Terry). Geez, you were actually with-it enough to give Romain his credit, unlike me. Thanks for checking out that link, m’dear, you were in a select and tiny crowd of persons who mentioned going to see it. And Lance, well, he’s just the Cool Dude of the Century, I think. And I bought a pale yellow shirt (V-neck, 3/4 sleeves, injected with Lycra(tm) just last week at HellMart for $9.99. I who never wear yellow. Is it just me (or that photo) or does he seem to have little skinny legs under that sign? Is this a South Park moment? Forgive my levity, dear Kate. Maybe I need a stronger specs prescription. No, I think you’re right. Either he has itty-bitty legs, or on my second inspection, it seemed like perhaps he had elephant legs. Regardless, he is, as you so aptly said it, Cool Dude of the Century. As for yellow, I cannot say that I wear it well in an ensemble context, but I never take off my wristband except to shower and sleep. Even though SECRETLY many of you know (?) I spend significant time in my lounge-wear (okay, PAJAMAS), I put my LIVESTRONG® wristband on whenever I get out of bed.